Register now for your on-site health screening! Discover your numbers – A free health screening* event has been scheduled at UW-Green Bay for employees (and spouses) who are enrolled in the State of Wisconsin Group Health Insurance Program. At an on-site screening, you’ll learn your measurements for blood pressure, body mass index (BMI), cholesterol (HDL, LDL, and total), triglycerides and glucose, and be in and out in 20 minutes. Time: 7:30 a.m. to 1:30 p.m.
Register on the StayWell website and click on the Programs tab, then Health Screening, and Onsite Appointments. Then you can search by zip code (ex. 54311), and select UW-Green Bay. Complete three steps by October 19, 2018 to earn the $150** Well Wisconsin incentive. Attend an employer sponsored event or if you plan to see your health care provider, ask them to complete the Health Care Provider Form, available on the StayWell website. STEP 2: Complete the StayWell health assessment** on the StayWell website. It takes about 10 minutes and is mobile and tablet friendly! 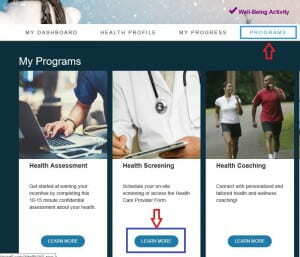 After logging into the StayWell website, click on Health Assessment at the top right. STEP 3: Complete a Well-Being Activity through StayWell. After logging into the StayWell website, click on Well-Being Activity at the top right. For more information on on-site health screenings or the Well Wisconsin Program, log in to the StayWell website. NOTE: You must register ahead of time for this health screening – they do not allow walk-ins that day. *Health information, including responses to the health assessment, are protected by federal law and will never be shared with ETF, the Group Health Insurance Program or your employer. **All wellness incentives paid to participants of the State of Wisconsin Group Health Insurance Program by StayWell are considered taxable income to the group health plan subscriber and are reported to your employer for tax purposes.